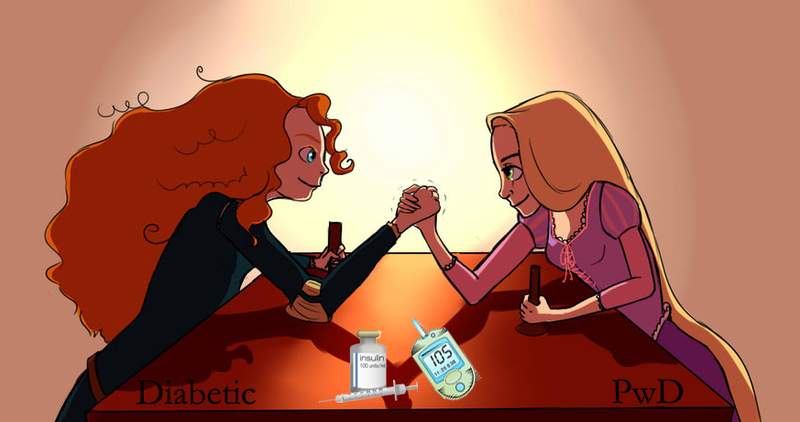 DBlogWeek: PwD or Diabetic … OR T1Diabetic? I’ll put it out there up front: I really just don’t care. I am not offended or feel labeled by being called a “diabetic.” PWD is a short-hand way but most people not as involved in the DOC don’t know what that means. And so have to say “person with diabetes” just makes having diabetes seem even more cumbersome. Just how I feel. About that time, discussions were surfacing on the issue of sensitivity to being labeled “diabetic.” Patients felt it important to say they were “persons with diabetes” as diabetes doesn’t define them. “I have “diabetes” but I am not a “diabetic. And now, in the twenty first century, we are referred to as “Type 1 diabetics” or “T1D’s”, or “persons with Type 1 diabetes”, which are not to be confused with Type 2 or Type 1.5 diabetics, even though we all have diabetes. I am aware that the American Diabetes Association has made it a point to not use the word “diabetic”, as a noun, so as not to give a “label” to those with the disease, diabetes. According to the Merriam-Webster Dictionary, a “diabetic” is defined as “a person affected with diabetes. I choose to use the term “diabetic” to refer to any “person with diabetes”. This is not meant as a slight or insult but simply a shortcut. I do not mean to offend or upset those persons living with diabetes and I do understand the issue. Enough about me now. I put out a quick survey to the support group I run with about 80 pro-active and vibrant T1s … and started to get answers back within 10 minutes! I must comment that this question really seems to spark a nerve! I’ve heard from folks who rarely say peep. it’s made me crazy. Everyone has an identity. I believe we create our own by how we see ourselves. Thanks, (SR) – your description is exactly who we are and more! (SR), I was also diagnosed 46 yrs ago. We should throw an anniversary party! A majority, if asked to choose, said they’d prefer “Type 1 Diabetic” to “Diabetic” or “PWD.” Interesting because that is even more of a label. But it is more descriptive, more direct and requires less explanation. Perhaps we might get different answers if we polled T1 teenagers or parents of T1 children? What do you think? Interesting little samples of how people all think differently. I guess we’re all different. I am a Type-1 Diabetic. I like clarity. I like simplicity. I like no confusion. This does it all for me, every time. The others don’t, for me. I’m of a very similar viewpoint. Diabetic or PWD makes little difference to me. There are other things that are more important to consider. After 23 years of having diabetes, I’m just used to saying diabetic. Person with diabetes takes a lot more mental effort to say but at the same time I don’t want to offend anyone so I try in the diabetes blogosphere to not offend but when talking to non-diabetics, I’ll probably just say diabetic. It’s very interesting to see your research. I personally prefer the term PWD or has diabetes. I think we should all use the term that we are comfortable with when describing ourselves. As the research shows, we are all different. After I wrote the post, I kept getting more responses … and it was just scattered across the board. It is wildly personal. As a parent of a child with diabetes..I’ve never called him a “diabetic”. It doesn’t come naturally to me. I would not be upset, though, if someone called my son a diabetic. I don’t think he cares either way. Thanks Reyna. What I learned is that it is so highly personal. For me, at the end of the day, I don’t feel better or worse about myself and I still just need to do the stuff to live with diabetes. Wishing you serenity and sending you kudos on being such a good parent of a child with diabetes.